Discussion in 'News and Information from LnLP' started by David Heath, Jul 19, 2017. Lock 'n Load Publishing will be attending WBC 2017 and we look forward to seeing you there. Keith Tracton will be demoing the World At War 85 Storming the Gap for anyone that wants to try it. Tony Costa will be showing one of our latest releases A Wing and a Pray. Sean Druelinger will also be attending and with our newly released Stalin's Triumph game from our Nations At War series. Sean may also be willing to take a few players in a round or two of our designed Lock 'n Load Tactical Card Game, yeah I know we need a better name. So if you don't know what WBC is below will give you a little bit of an idea. The BPA’s largest event is the annual World Boardgaming Championships® (WBC) where many wargamers from around the world compete to be named champion of their favorite games. Competitions are scheduled in 150+ games consisting of the Century Group, Legacy events, Trial Events (selection by member votes), Junior events, and Vendor/Sponsor events. Special Events demonstrating new or upcoming games as well as gaming related seminars add to the nine-day Convention. WBC 2017 will run from July 22 to July 30. You need not be an expert player. many are designed for beginners or are coached for first-time players. Read the 2017 WBC Event Previews. Find out who is already signed-up to attend WBC. 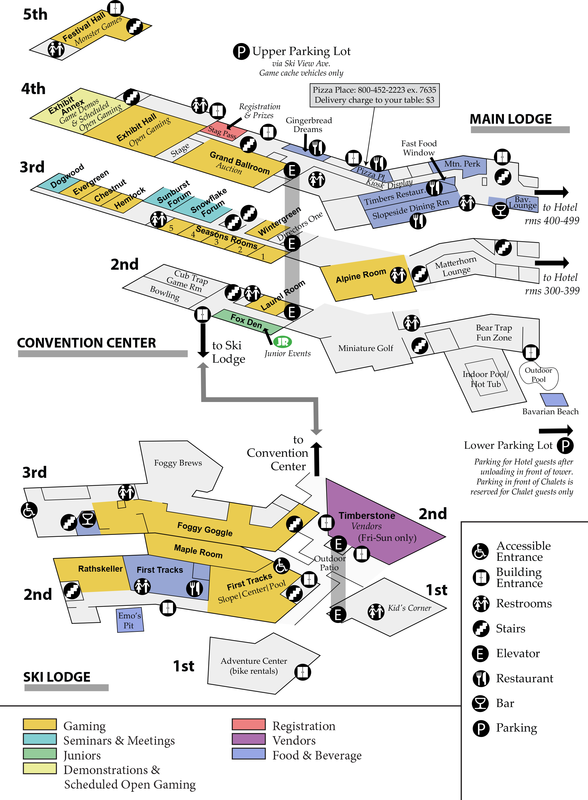 View a color-coded map of Seven Springs Resort.